Have you ever heard the expression "The cobbler's son wears no shoes?" How about "A plumber's house always has a dripping tap?" Whatever version of the proverb you're familiar with, the message remains the same: craftsmen simply do not enjoy the benefits of their own craft at home or in their workplace. At UNEX, we're all about efficiency. Making sure workers minimize risky movements, especially those that leave one vulnerable to repetitive stress injuries (RSIs), is our bread and butter. According to a recent Liberty Mutual Workplace Safety Index, overexertion is the number one most disabling workplace injury in the United States. That's why all of our solutions are focused on reducing or completely eliminating overexertion in order picking, packing, shipping, and assembly processes- just to name a few. However, in some aspects of our own operation, it seemed as though the "cobbler's children"- in this case, our own workforce- were wearing no shoes. Take, for example, the way our assembly workers were being fed hardware during their daily activities. We have approximately 150 SKUs of heavy-duty hardware, weighing in between 20 and 50 pounds, that are hand stacked on pallets about 48 inches off the floor. Assembly workers pick hardware from the closest box, discard the empty, pull the next box forward, pick from that box, and so on. While the raised height of the hardware made it a breeze for material handlers to replenish the shelves, it was a nightmare for assemblers to pull boxes forward from the rear of a 42 inch deep rack for picking. The pick was a very awkward full arm extension to grab and retrieve an item up to 50 pounds. In short, these picks were a recipe for RSIs. It was clear the cobbler needed to craft a pair of shoes for his children, and to do it sooner than later. Enter Pick Plank. Pick Plank is a drop-in shelf for use with pallet rack with the ability to slide the top plank of the solution forward. Pick Plank provides an effortless pull of just 3% of the total weight of the SKUs sitting on the plank, which maxes out at 22 pounds of pull. Translation: instead of reaching into the rack, grabbing a 50 pound box of hardware, and pulling it forward manually, you can instead pop open the Pick Plank's lock and slide the whole top of the device forward with ease. 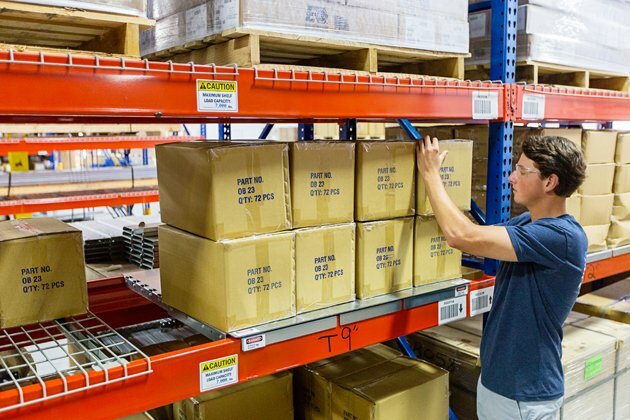 Pick Plank is designed to fit any 42 inch deep bulk and pallet rack system, making it great for operations that already have row after row of pallet rack- like ours! During early prototype versions of Pick Plank, our assembly workers gained an intimate knowledge of how the product worked and the benefits they could provide. These workers were also intimately familiar with the stress and exertion caused by some portions of our part picking processes. Shortly before the design of Pick Plank was finalized, an employee by the name of Woody approached management and requested several units for the rack where their hardware was stored. Of course, management agreed- what better way to gauge a product's benefit than to provide it to your own workers and see how it impacts their productivity (and downtime due to injury)? The entire 48 inch level of the rack in our assembly area was outfitted with our brand new Pick Plank, and the heavy boxes were once again hand stacked and ready to be picked. The results of Woody's request completely validated the philosophy behind the solution's design. With Pick Plank, assembly workers were able to easily pull new boxes of hardware forward to the point of pick without requiring a full arm extension and a 50 pound lift well outside the Golden Zone. Pick Plank helped to completely eliminate the risk of an RSI during the assembly workers' picks, increased the speed of their picks, and reduced the vertical space required for the same number of SKUs by eliminating the need for a pallet underneath them. The cobbler's children were finally wearing shoes!